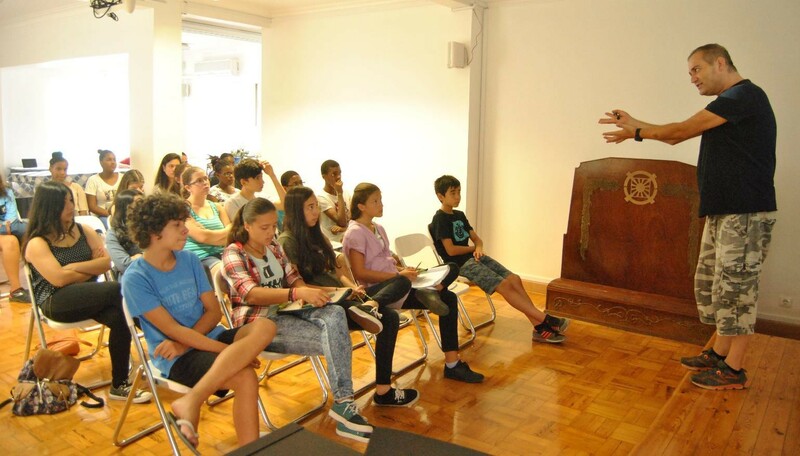 By FFWPU Portugal, Sergio Neto: We organized the summer workshop for second generation and Jacob children on August 2-7, 2015 with the theme “All different, all equals”. We had 49 participant including 9 adults and 3 elder second generation who helped organizing the teams. Following Camberg workshop, where 12 people participated from Portugal, this workshop gave the participants the opportunity to come together one more time, share, laugh, grow and unite. It was a very good way to see that those who participated had a special experience and that it moved them profoundly. We started the WS in the Lisbon center and we had the first lectures about faith and responsibility, activities and we watched a movie related to the theme. As usual we had 5 teams that washed dishes, helped in various chores and made the group easier to handle. The place we chose this year was 170 km south from Lisbon. It was a camping with less people, with a lot of space, near the beach and we with good conditions for our schedule. Every day we had morning pledge and HDH in the nature. We are usually not that noisy, but this time it didn´t matter that much since our camping site was large enough and we didn´t disturbed others. Every day we had beach time, small presentations, games and free time. We also had the opportunity to experience fishing in a dam nearby. Although the time was short we managed to catch some fishes. Altogether the workshop this year ran smoothly, with no incidents, and that made the atmosphere very relaxed and peaceful. Around our camping site there were many wasps. It was close to a miracle that nobody got stung and we cohabitated with the insects in the best way possible. In the last day, before living the sky darkens and we got a bit of rain. We guessed that it’s because the place was sorry we have to go. This year it was a good WS; the children are growing and learning many things. Their attitude improved in the last period and that gives us hopes for the future. We had a very good time and recharged our batteries for the next school period.